In Canada, retail trade volume rose 1.9% in 2011 after increasing 5.3% in 2010. In the United States, volume grew 4.6% in 2011 after rising 5.2% in 2010. 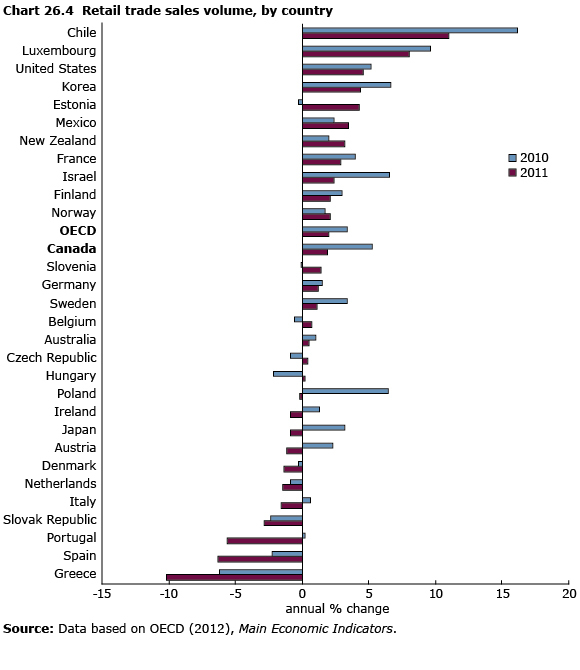 Across the OECD, volume grew 2.0% in 2011 after a 3.4% increase in 2010. Retail trade volume rose the most in Chile in 2011 (11.0%), following a 16.1% increase in 2010. Retail trade volume fell the most in Greece in 2011 (10.2%), following a 6.2% decrease in 2010.